Short Prints noted in parentheses. Silver Game-Used Jersey - 90 per card, Gold Game-Used Jersey - 10 per card, Silver Game-Used Patch - 9 per card, Gold Game-Used Jersey - 1 per card. Silver - 9 per card, Gold - 1 per card. 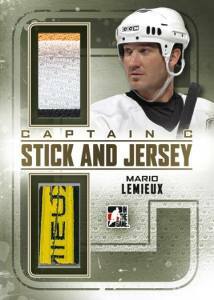 Cards include pieces of both a game-used stick and game-used jersey. Silver - 40 per card, Gold - 10 per card. Silver - 9 copies per card, Gold - 1 copy per card. Silver - 9 of each card, Gold - 1 of each card. Cards feature half of a C patch. Two cards fit together like a puzzle. Two of each card, the top and the bottom. Silver - 50 copies per card, Gold - 10 copies per card. Silver - 9 per card, Gold -1 per card. 2011-12 In the Game Captain-C Hockey honors the role of the team leader by dedicating an entire release to some of the sport's best captains. Wearing the C patch on the front of a hockey sweater is considered a major accomplishment in the game. 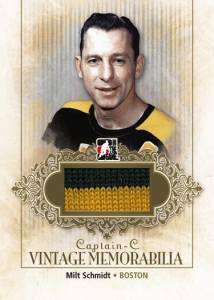 Going deep into hockey's history, 2011-12 In the Game Captain-C pairs legends like Jean Beliveau and Bobby Clarke alongside current superstars such as Roberto Luongo. The 100-card base set is printed on foil stock, promising the shine goes beyond the stars depicted on them. Five come in every box, meaning that it'll take a bit of patience to put a set together. Also included in every box are five total autographs and memorabilia cards. The game-used lineup includes sticks, jerseys and patches. 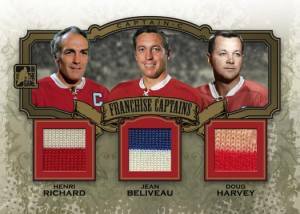 Franchise Captains cards include swatches from three players from a single franchise who have worn the C.
The 2011-12 In the Game Captain-C base set consists of 100 players in hockey history who have been their team's appointed leaders. Base cards, which fall five per box, are printed on foil stock. Autographs and game-used memorabilia cards are inserted five per box. Hits will be paralleled with both Silver and Gold versions. 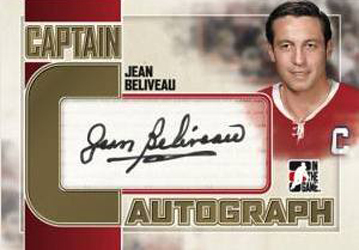 Confirmed autograph signers include Jean Beliveau, Bobby Clarke, Roberto Luongo and Dave Keon. In the Game promises a small print run for the product. 2011-12 IN THE GAME CAPTAIN-C RICK NASH GOLD AUTO AUTOGRAPH SP BLUE JACKETS! Good: Some might argue the price tag to be a little steep for five hits. Personally, it seems reasonable given the content in 2011-12 In the Game Captain-C. The checklist consists of 100 of the top leaders from the past, present and, potentially, the future. Thus, the potential of some of these cards will likely attract a wide range of collectors. Made with holofoil, the base cards have a nice refractor-type feel. The design is different from the past couple ITG products. The backgrounds match up with the teams colors. It's a very nice change for the base set. 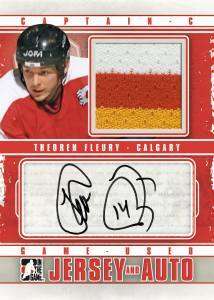 There are a variety of autographs and game-used cards in 2011-12 In the Game Captain-C. The checklist includes autographs from Mats Sundin, Joe Sakic and Gordie Howe. There are also game-used cards from Nicklas Lidstrom, Mario Lemieux and Steve Yzerman. Toss in several levels of game-used patch cards and there just seems to be a ton to collect for every type of hockey card collector. With just 4000 packs, the print run of each card is low. Crunching numbers, there's around 200 copies of each base card. This is a much more likeable product than the previous couple of recent ITG lines of cards. It also has a ton of potential for huge pulls. Bad: ITG tends to use a stock background for a lot of their cards. I would prefer the picture of the player to include more of the actual background. This would make each feel more unique. Personally, I like to see the city name on the front of the card. I understand the licensing issues that prevents the use of logos, but putting the name of the city should be okay. ITG does it in some sets but not others. 2011-12 In the Game Captain-C takes a step back with no city name. 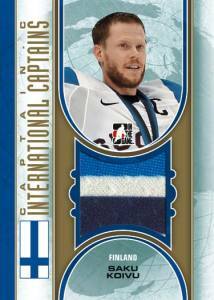 It would have been especially nice to add the NHL team city on the front of the prospect cards, where applicable. Adding print runs would be a nice addition to all of the cards in the set. Some may not understand that the cards are limited. While ITG does a good job of announcing print runs, not having them on the card makes it confusing for collectors (especially those without Internet access). 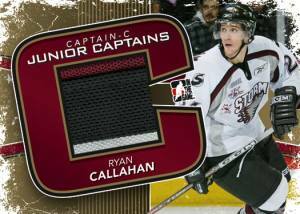 The Bottom Line: At about $100 per box, 2011-12 In The Game Captain-C definitely has enough star power to be worth the price of admission. The names on the autographs and game-used cards should give the consumer plenty of bang. With the low numbering for all the game-used and even the base cards, this is a very exciting product to break. The clean design of the cards, and the refractor-like holofoil material of the base cards make for a very attractive product. I love the way that ITG has updated the design of the cards. The holofoil stock used for the base cards makes for a more collectible product. It'd be nice to see similar technology used on some of the game-used and autograph cards. If this is the future of ITG products, there are likely good things to come. 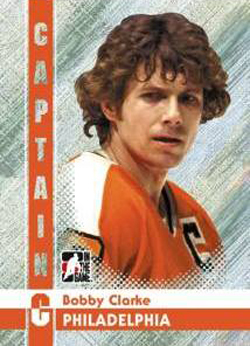 The 2011-12 In the Game Captain-C checklist is outstanding. 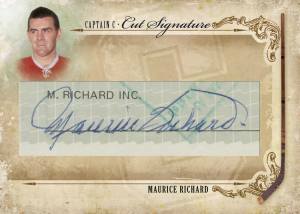 From Lemieux to Howe, this product has the potential to give collectors some high-end additions to their personal collection. The inclusion of junior leaders should appeal to prospectors as well. 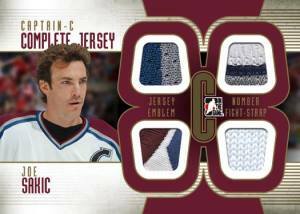 It's the type of product that should appeal to almost any type of hockey card collector. Even though our box did not produce any major hits, the cards we got were still pretty sweet. So while there was a little disappointment, the cards should retain pretty good value. The autographs in our box were a little weak and I would have hoped that one would have been a bigger name. But, as it goes with box breaking, it really comes down to the luck of the draw. There was a little more excitement breaking a 2011-12 In the Game Captain-C box than the past couple of boxes from the company. The potential to grab something huge always makes for an exciting break. The fact that there is only one pack brings the fun factor to the forefront pretty much immediately. This could be seen as a drawback as well. This product does a great job of mixing veteran and retired players with up and coming junior players. It focuses on the leaders on the ice for the teams. The couple of shortcomings are made up for by the big-name players on the checklist. ITG has also taken notable steps to improve the base cards. 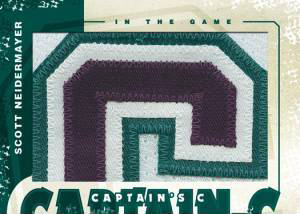 Overall, 2011-12 In the Game Captain-C is a very nice product. Looks like everything else ITG produces. The foil cards look awful, the GU is stale and they are still using that baby crap brown on their cards. Still can’t figure out why people buy this junk.